Ground And Surface Water: A Comprehensive Overview Of Freshwater Usage In The U.S.
A Comprehensive Overview Of Freshwater Usage In The United States How Much Freshwater Does The United States Use? Freshwater is vital to human survival. Our ancestors had the keen awareness that it was strategically advantageous to settle near rivers. This understanding drove the transition from tribes of early hunter-gatherers into civilization as we know it. Along with being a consistent source of drinkable water, rivers provide fertile land for hunting, fishing, agriculture, and transportation. After thousands of years of civilization, many of us no longer need to dwell near freshwater sources to experience the benefits. Advances in technology have drastically changed the means of water collection, treatment, and distribution. 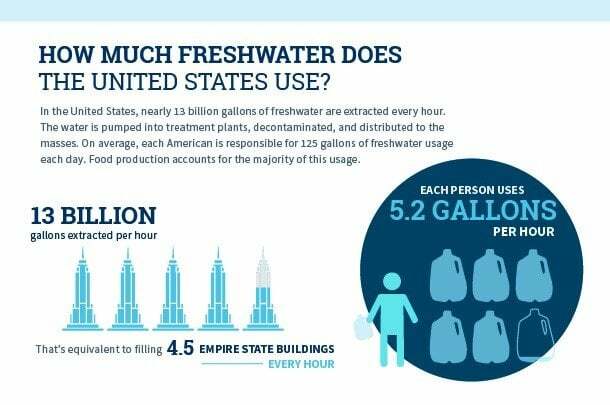 In the United States, nearly 13 billion gallons of freshwater are extracted every hour, which is equivalent to filling 4.5 Empire State buildings every hour. The water is pumped into treatment plants, decontaminated, and distributed to the masses. On average, each American is responsible for 125 gallons of freshwater usage each day. That’s 5.2 gallons of water per hour. Food production accounts for the majority of this usage. Approximately 70% of the Earth is covered in water, but only 2.5% of it is usable freshwater. Here’s the kicker: only 1% of the freshwater on Earth is able to be extracted for treatment. The rest is frozen inside of glaciers and snowfields. Surface water and groundwater are the primary sources for freshwater extraction. Surface water originates from rivers, lakes, swamps, and marshes. It accounts for 75% of the total freshwater used in the United States. Surface water is pumped to a water treatment plant where it is treated and distributed to municipalities. The Great Lakes alone provide 84% of North America’s freshwater supply. To account for this, 1.75 million gallons are withdrawn every hour. Another large source is the Mississippi River. More than 50 cities depend on it for their daily water supply: that’s 15 million people. The Atchafalaya Basin is an example of swamps that provide surface water. One hundred and fifty thousand gallons are withdrawn from the Atchafalaya every hour. As the population continues to grow, there is an urgent need to ensure that freshwater sources remain clean and sustainable. Groundwater lives below the Earth’s surface. It accounts for 25% of the freshwater used in the United States. This water seeps through soil and fractures in rock formations, ultimately pooling in naturally occurring underground reservoirs known as aquifers. Groundwater is extracted from aquifers and pumped to water treatment plants. It is then treated and distributed to the masses. The Ogallala Aquifer is the largest groundwater system in North America. It contains enough water to cover all 50 states in 18 inches of water. Another example is the Edwards Aquifer. Each hour, 13.69 million gallons is pumped out of its reservoir. That’s equal to 20.7 olympic-size swimming pools. The Floridian Aquifer supplies 150 million gallons of water each hour from it’s reservoir. Freshwater is used in a variety of ways. Obviously, we need to drink it to stay alive. But there are many other uses. Freshwater is used to manufacture consumer goods, plastic, and food. It is also used to power the world around us. Agricultural irrigation alone uses 38% of all freshwater. Thermoelectric-power generation also accounts for 38% of freshwater use, but it is typically returned to the water supply—making it far more sustainable. Other uses include mining, industrial, aquaculture, livestock, domestic and public supply. Each day, Americans use significantly more freshwater per capita than people in other similarly developed nations. For example, the average American uses 4x more freshwater every day than the average German. Americans use 125 gallons per capita per day, while Germans only use 31.96. While a portion of this discrepancy is owed to the widespread geography of the United States, that alone doesn’t account for the difference. Canada, another sprawling nation, manages to use 40% less freshwater per capita on a daily basis, at only 81 gallons. In comparison, Great Britain and France use 39 and 43.3 gallons per capita per day, respectively. The cost to use this water is not equal across nations. Based on a 2012 report from the International Water Association—and calculating for a 17 gallon / 8.2 minute shower (U.S. averages)—the price of a shower can cost as much as 92 cents in countries like Madagascar and India, and a whopping $3.82 in Papua New Guinea. On the low end, showers can be as cheap as $0.03 in China and Argentina. In the U.S., our showers average about 16 cents. But taking a shower can cost as much as 70 percent of the average person’s daily income in countries like Papa New Guinea. People in Ethiopia and India would have to use one fifth of their daily income to pay for the same hot water that so many of us take for granted. If an American citizen had to spend 70% of his or her daily income on showers, it would cost $83 per day! When you look closely at American’s water use, it’s important to not only notice the quantity and cost, but the ways in which we’re using this water. One-fourth of all the water used by Americans is from toilets and sewage systems. Washing clothes accounts for 17% of our daily usage, while 19% of our usage is from the sink faucet running. Our household showers account for 20% of our usages, while 12% can be attributed to leaks found around our home. And within our households, age plays a role in our consumption habits. When it comes to our most precious resource, water, Baby Boomers are leading the most conservative path by showering and running the dishwasher the least, while Gen-Xers are most likely to shower more than 7 times in a week. Millennials are keeping their jeans as fresh as possible by never or rarely washing them, which helps cut down on water waste. However, when it comes to food, one good habit cancels out the other for Boomers and Millennials. While Boomers are most likely to eat meat more than five times a week-a disastrous strain on the environment-Millennials are the most vegetarian-conscious generation. Conversely, Millennials are more likely to waste more than 10 pounds of food a week whereas Boomers are the most careful about food waste, choosing to compost instead. Gen-Xers also opt for composting, proving that younger generations could stand to learn something from their elders. There is a pressing need to reduce the collective water footprint in the United States for long-term sustainability. It took ingenuity, money, and cooperation to establish our current freshwater distribution network. This complex process conveniently brings freshwater to homes and industries across the country – cleaning, feeding, and powering a nation. Our current rate of consumption is not sustainable, and there is an increasing need to reduce our collective water footprint. Solving the riddle of sustainable water usage will require awareness, education, and bold solutions. As environmental factors shift, it is more important than ever to conserve freshwater. Climate change continues to deplete our resources, while demand for those resources increases. It’s important for Americans to be educated and conscious about their water usage. The most at-risk sector of our current water consumption is agriculture. As climate change occurs and conditions become less predictable, we’ll likely have to use more water to produce the food we eat. Beyond usage alone, changes to where our water comes from and the condition of that water will affect what, when and how we grow crops. Americans consume substantially more water than other countries, and we have to find ways to conserve water to help fight this global issue.